← Actually, they can talk. You just have to listen. WakeUp and Emily in the warm up. On Sunday Christy and I ventured out to Lamplight, a gorgeous show ground outside of Chicago, to see the young horse selections (and some other rides). In particular, we wanted to see WakeUp, a six year old stallion, and one of the top young horses in the world – he just missed making the finals in the 5 year old championship in Verden last year. 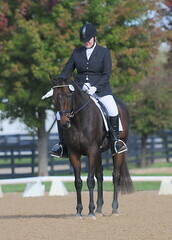 WakeUp, ridden by Emily Wagner, took top honors this weekend too – you can read about it on Dressage Daily. Because he’s still a youngster, WakeUp was shown in a snaffle, and the six year old test doesn’t ask for upper level movement. It does ask for collection and extensions in all gaits, however, which was really fun for me to watch. I don’t yet know enough yet to be able to spot details like late changes behind in a line of tempis, for example, but I am starting to develop my eye for gait quality. WakeUp is a “wow” mover. He’s so through, supple and suspended that he makes other horses – other lovely, lovely, horses – pale in comparison. What was really interesting is the fact that WakeUp, according to some reports I’ve seen, is 17 hands tall. I was surprised when I read that fact this morning, because he doesn’t look it. He’s so well balanced and works so beautifully within himself that he appears smaller. There’s nothing hulking or gangly about this horse. He just might be perfect. A ten walk, or close to it, leaving the warm up. This was the first time I’ve ever seen a ‘big time’ horse that is competing at the top of the sport internationally. 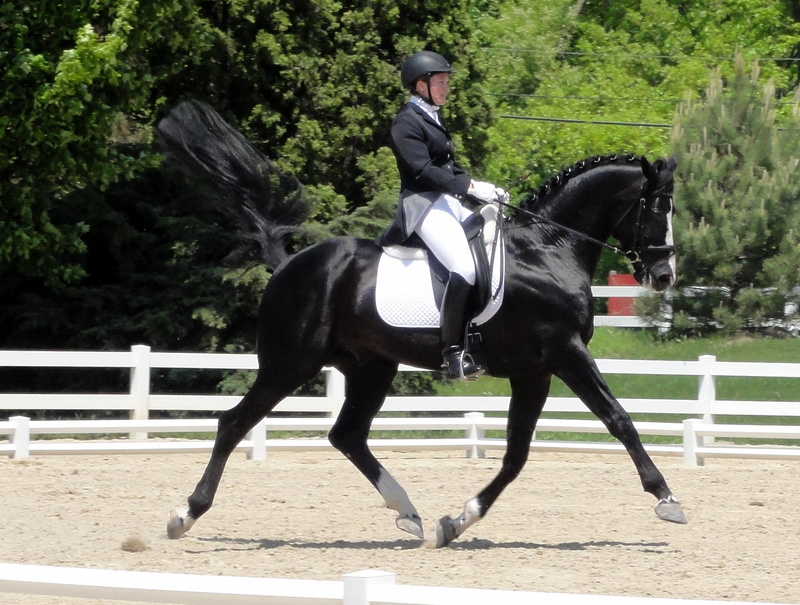 And it was fun to hear my fellow spectators – some of whom didn’t know who that black stallion in warm up was – exclaim at his beauty and presence. Their comments affirmed and validated my own reaction to watching this gorgeous horse. WakeUp is a truly exceptional horse. It was a treat and a privilege to watch Scott Hassler, the US Young Horse dressage coach, put WakeUp and Emily through their warm up paces. And it was fun to see Emily’s big smile and hear her say “I’m ready!” at the end of the warm up, minutes before turning in a performance Dressage Daily called “nearly flawless.” WakeUp was bred in Kansas, and is registered with the American Warmblood Registry – proof that you don’t need an import to play at the highest levels of our game! Thank you so much for sharing! And look at those photos – look at his neck. While head and neck position aren’t a key, they tend to be a tell-tale of what’s going on with the horse’s body. The folks I see winning locally have horses who are naturally fantastic movers… who they immediately crank into a frame. I haven’t seen any of those folks schooling at home, but wasn’t surprised when I was told they tend to use gadgets to put their heads where they want. That focus on head results in a horse not continuing to develop larger and larger gaits, from all I’ve seen. With Lamplight, though, you can see the nose just ahead of vertical (barely) and longer neck – lift in the shoulder area, dropped haunches… His neck is actually quite arched, but farther back than you often see in young horses these days, because it’s due to how muscles are working rather than a bend caused by reins. 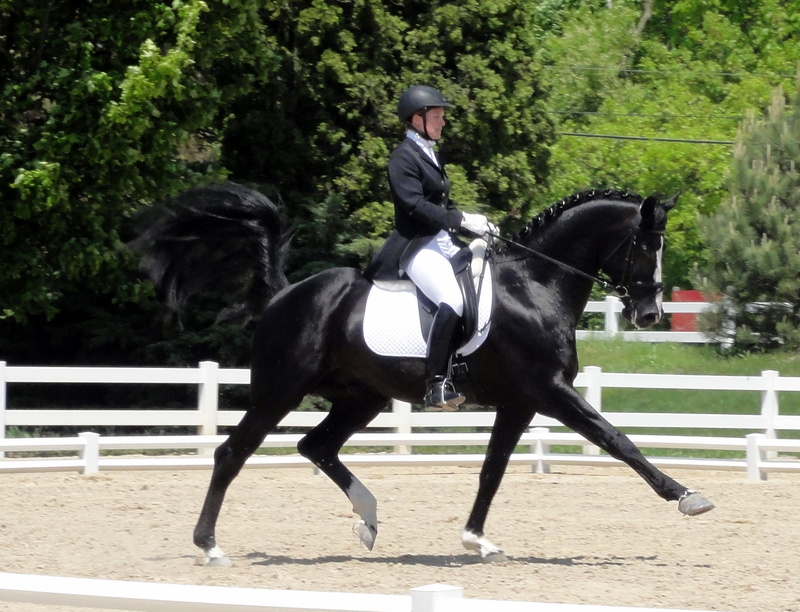 This is one rider I would love to work with, and would love to have ride my own (hypothetical, future) young horses! Isn’t Emily in either her late teens or early 20s, too? Very young, and yet very talented. Emily is 23, her mother comes to our barn and gives lessons. You could not ask for a nicer, more down-to-earth family who puts the horse first every time. I have seen Wake Up throughout his life, and he took my breath away every time I saw him. Once I had to get Jana because Barcode the zebra was scaring Wake Up and I was afraid he would escape. Jana looked at me like I grew a second head, but went and checked on her baby. They moved him out of the portable stall into the main barn about the time Barcode was going to do his routine. Jana looked at me and said in her VERY thick German accent, “There really WAS a zebra! !” Like I would make that up. What a great story, Catherine. Thanks for sharing (and for stopping by Collecting TBs!) 🙂 I’m glad to to hear they’re ‘put the horse first every time’ people. I’m an even bigger fan of Team Wake Up now!